﻿ How to Convert YouTube to Windows Media Player on Windows 8 or Mac? 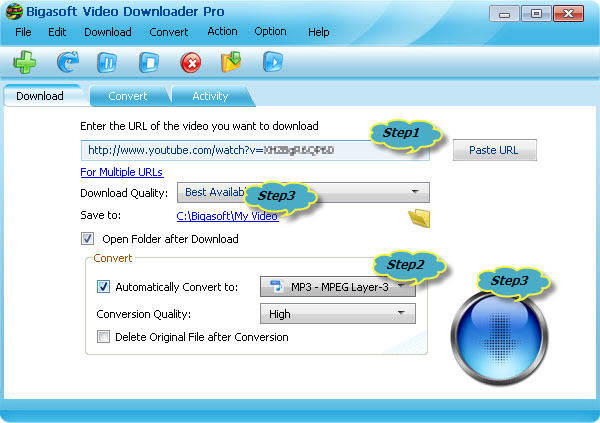 Home » downloader » How to Download YouTube to Windows Media Player on Windows 8? How to Download YouTube to Windows Media Player on Windows 8? Have you ever thought to download YouTube to Windows Media Player so as to successfully play YouTube in Windows Media Player? Though there are many online or offline YouTube Downloader tools which can helps to download and save videos from YouTube, most of them only allow to save the YouTube video as FLV, 3GP, MP4 and WebM format. In this case, you will fail to play the downloaded YouTube in Windows Media Player. For Windows Media Player only natively supports to play WMV, AVI, MPG, MP3, WMA, and WAV. The following article will introduce a professional YouTube to Windows Media Player Converter as well as a step by step guide on how to download and convert YouTube video to Windows Media Player supported video or audio format on Windows or Mac. Bigasoft Video Downloader, the professional YouTube to WMP Converter and Downloader, can fast download and convert YouTube to Windows Media Player compatible format in just one click. And it has both Windows version and Mac version. 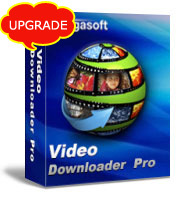 Bigasoft Video Downloader for Windows supports convert and download YouTube to WMP on Windows 8, Windows 7, Windows XP, Windows Vista and Windows 2000. Bigasoft Video Downloader for Mac is compatible with all any version of Mac like Mac OS X Mountain Lion, Lion, Snow Leopard and etc. One-click to download and convert YouTube movies to Windows Media Player supported WMV, AVI, or MPG. 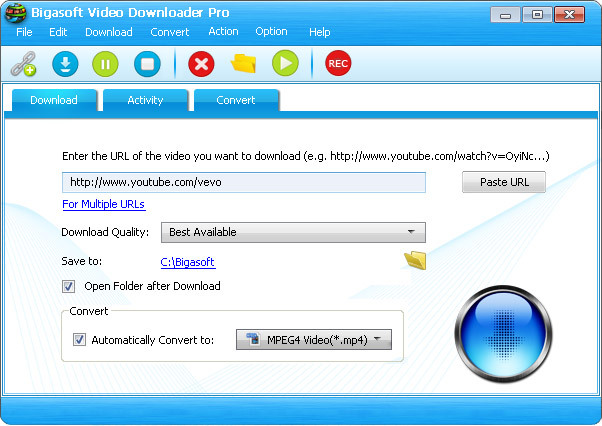 One-step to download and convert YouTube video, music video to Windows Media Player supported MP3, WMA, WAV and etc. Download YouTube to WMP in HD (high-definition 720p, 1080p, and 2k), ultra high definition (4K), or 3D video and stand definition. Download YouTube to other audio formats like OGG, FLAC, M4A, AIFF, MP3, AC3, AU, and RA. How to Download YouTube to Windows Media Player? Free download the Windows version of the professional YouTube to Windows Media Player Converter - Bigasoft Video Downloader Pro (Windows Version, Mac Version), install and run it, the following interface will pop up. Go to the YouTube video page and copy the URL of the video you wish to play in Windows Media Player, Bigasoft Video Downloader will automatically paste the copied URL of YouTube video to the URL text box. Usually, Windows Media Player can directly play movies in WMV, AVI, or MPG format (WMV is recommended) and play music in MP3, WMA, and WAV. Click the "Automatically Convert to" drop-down button to select WMP compatible video format like WMV - Windows Media Video(*.wmv) from the "General Video" category. To Convert YouTube to Windows Media Player friendly audio format, select WMA, MP3 or WAV as output format from the "General Audio" category. Click the "Download" button to start and finish downloading and converting YouTube to Windows Media Player compatible format. After it is completed, click the "Save to: " destination folder link to open the "Convert" folder to drag and drop the converted YouTube files to Windows Media Player for easy playback.